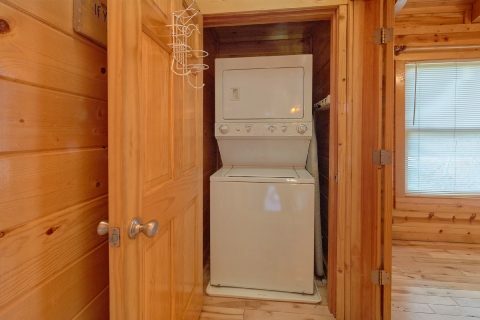 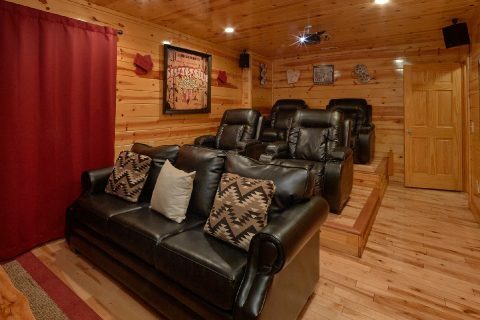 Theater Cabin Rental Pigeon Forge - "A Bear Endeavor"
"A Bear Endeavor," a theater cabin rental in the Pigeon Forge area located in Sky Harbor Resort, is a prime option for your vacation. 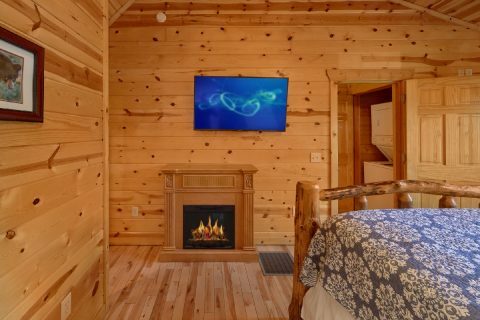 This cabin rental features a superior theater room with a large projection screen, surround sound system, and theater style seating. 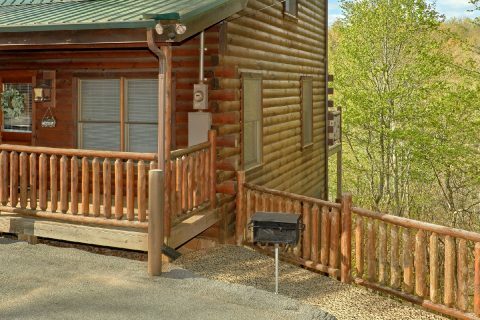 Sky Harbor Resort's convenient location, between Gatlinburg and Pigeon Forge, makes this Smoky Mountains area getaway your ideal destination for an unforgettable vacation. 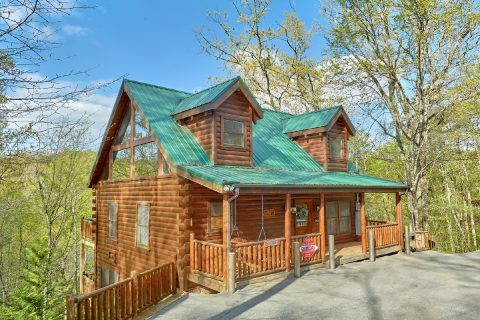 Enjoy both the scenic beauty of East Tennessee as well as area attractions like Dollywood, the Great Smoky Mountains National Park, and Ober Gatlinburg! 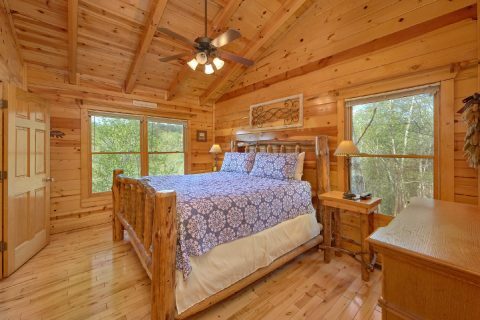 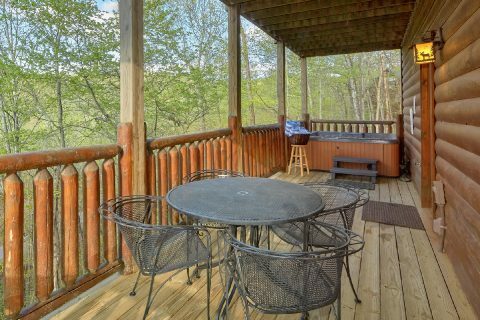 This gorgeous 2-bedroom cabin rental with internet access offers both rustic charm and modern luxuries. 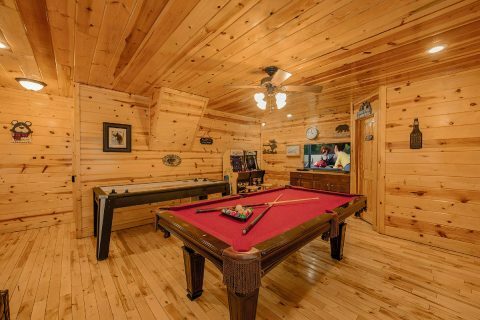 In addition to its deluxe theater room, the cabin's lower level offers a game room complete with an air hockey table, a pool table and a PlayStation 2 for hours of entertainment. 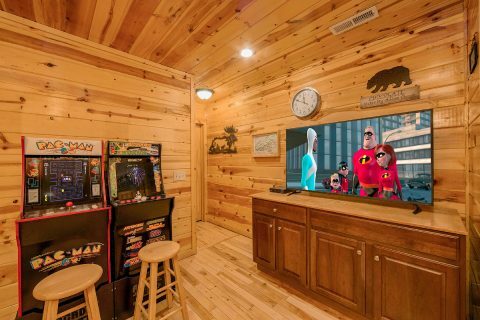 You can also enjoy some gaming nostalgia with both a Pac-Man and a 12-in-1 standup arcade game. 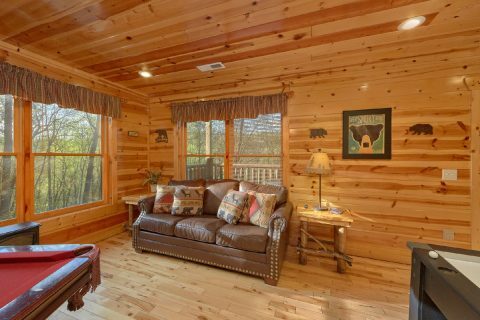 The main floor's open living area provides a space for quality time with family and friends. 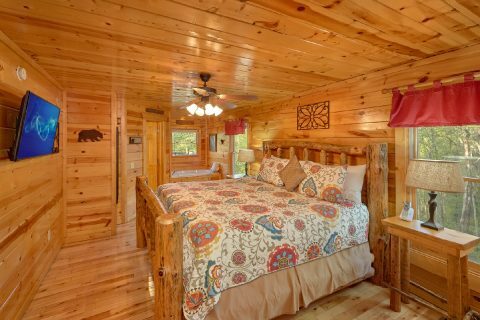 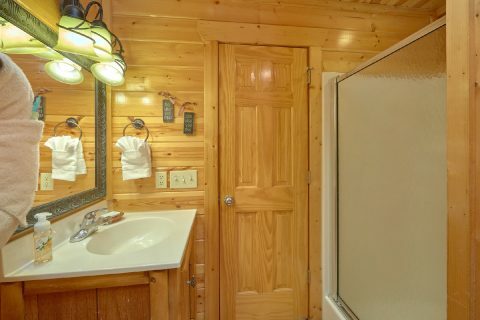 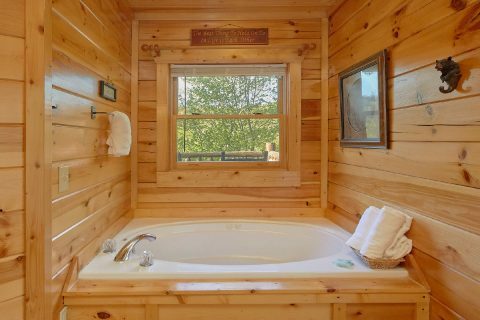 Each of this cabin's 2 bedrooms comes with a cozy king-sized bed – one even comes with its own jacuzzi tub! 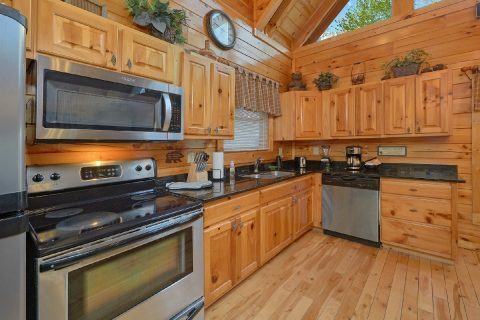 Cook delicious meals in the kitchen with its stainless appliances and warm up by the living room's gas fireplace during the cooler months. 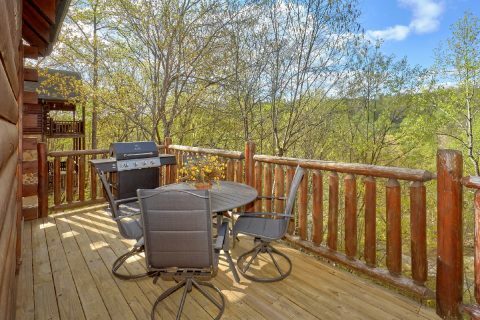 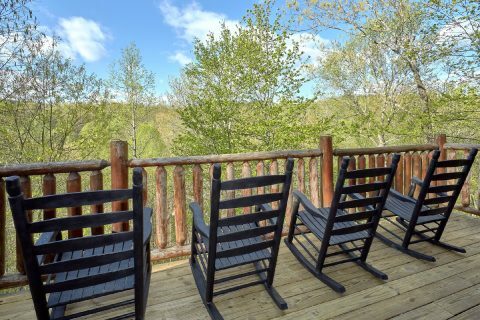 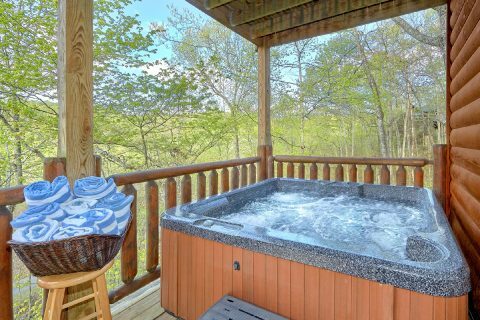 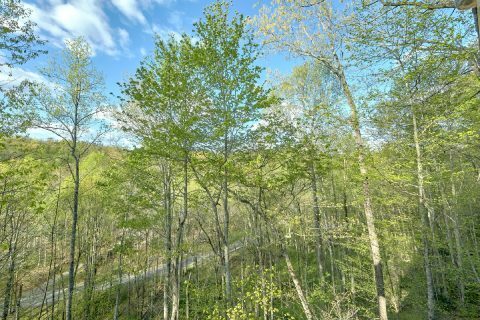 Gaze out over the treetops at the rolling hills of the Pigeon Forge and Gatlinburg area while relaxing in rocking chairs, soaking in the hot tub, or enjoying a meal cooked on the cabin's BBQ grill. 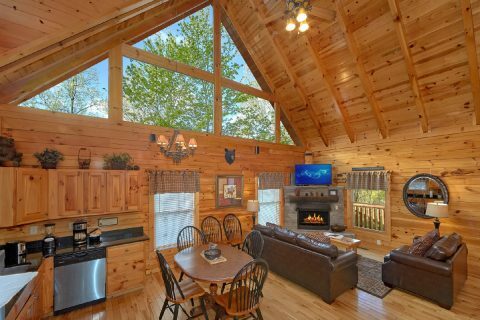 This Sky Harbor Resort cabin rental's location affords the convenience of being only a few minutes away from the region's exhilarating attractions. 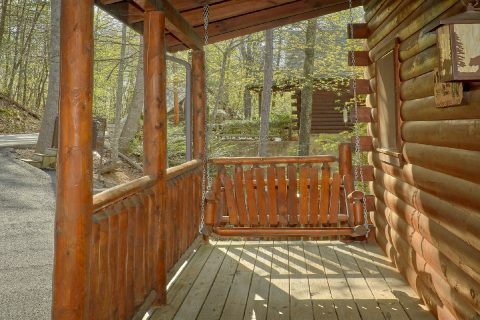 Roll down a hill in a zorb or fly through the air on a zip line! 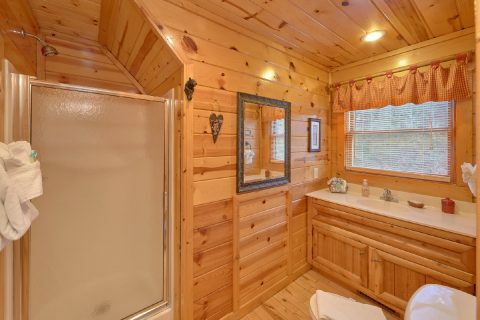 Visit the Smokies' early settlers' cabins at Cades Cove! 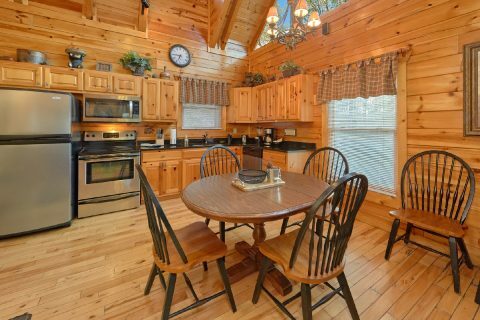 Grab a hearty breakfast at one of Gatlinburg's many pancake houses! 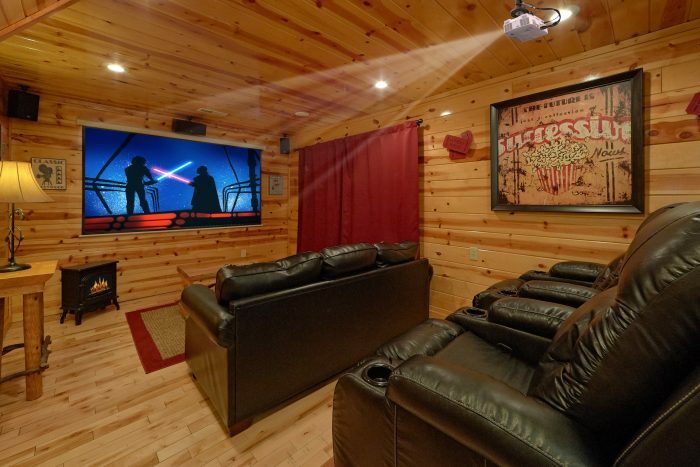 Then, after an eventful day, return to the comfort of your Pigeon Forge theater cabin for a movie night! 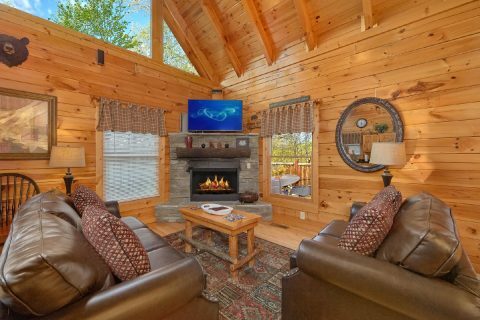 Make "A Bear Endeavor" your first step towards a memorable Smoky Mountain vacation at Sky Harbor Resort by booking online at Cabins USA!